"If you love Peanut Butter Cups, you'll love this cake! Tastes like "Peanut Butter Tasty Cakes" sold in Philadelphia. Can't get them here in Cincinnati so we bake this cake instead." Preheat oven to 350 degrees F (175 degrees C). Grease and flour one sheet cake pan or one cookie sheet with 1 inch sides. In a large bowl, beat eggs until lemon colored. Add vanilla and salt. Stir in sugar, flour, milk, baking powder, and melted butter or margarine. Bake for 20 to 25 minutes. Do not overbake. While the cake is still warm, spread with peanut butter. Immediately sprinkle with chocolate morsels, and put the pan back into the oven to melt the chocolate. Spread the chocolate evenly over the peanut butter. Refrigerate until chocolate is set. Alternatively, you can let the peanut butter cool and harden. Later, melt the chocolate, and spread it on the cake. It comes out in two distinct peanut butter and chocolate layers that way. It’s Texas sheet cake with a peanut butter twist. 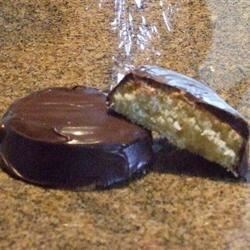 Growing up in the Philly area meant Tastykakes were a main staple in my lunch box! Definitely just like my favorite Tastykake of all, and yes, the milk chocolate chips are better to use. Being a true Philadelphian, I love this recipe. I do prefer it with milk chocolate and separate layers of peanut butter and chocolate! Excellent and everyone loves it!! Thanks!!! !